Would you like to reward a customer action that isn’t covered by our modules? With Antavo’s Custom events, you can reward any customer action in your store. 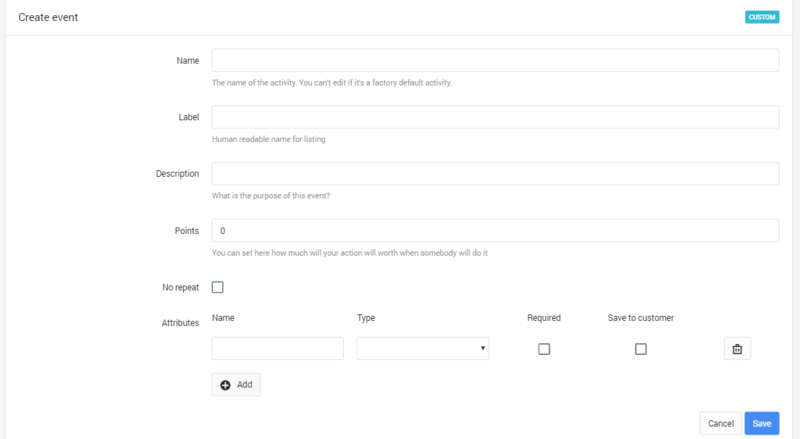 All you need to do is to define the event on the Custom events module configuration page and send the event through our API. Find the configuration page by clicking on the ‘Modules’ link in the top menu bar and then selecting the ‘Gamification modules’ from the list on the left-hand side. The page will open to a list of custom events that have already been set up. You can set the event as a non-repeating event, which means that we will throw away the event with an error message once it has been sent once already, so the event will not be saved in our database. If you’d like to further specify the event, you can add attributes. For example, if you want to reward customers not only for searching but for searching the text “new in”, you can add “new in” as an attribute. If you tick the ‘Required’ box, we will only save the event if the API call contains the attribute specified. In the list, click on the event you’d like to edit, change the settings and save your changes. Events cannot be deleted from the list, but if you decide not to reward the action anymore, simply set the point value to zero. If you don’t want to create challenges, add banners to your site to promote these new ways to earn points. And be sure to include new earning activities in your newsletters! Using the Challenges module, you can further specify conditions for the activity, such as maximum number of completions, repeat intervals, availability for specific segments, as well as start and end date. You can even define actions with negative points. A common use case for point deduction is a newsletter unsubscription event.